Natasha Wright, an MIT PhD student in mechanical engineering, has designed a solar powered system that makes water safe to drink for rural, off-grid Indian villages. 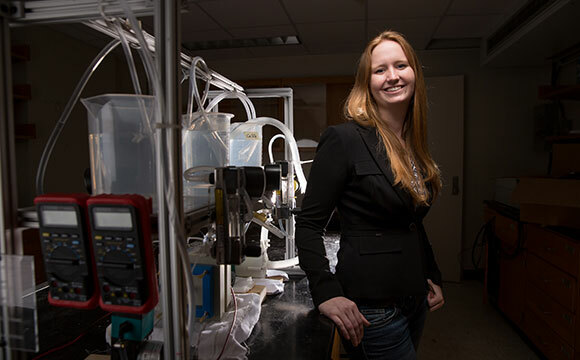 When graduate student Natasha Wright began her PhD program in mechanical engineering, she had no idea how to remove salt from groundwater to make it more palatable, nor had she ever been to India, where this is an ongoing need. Now, three years and six trips to India later, this is the sole focus of her work. Wright joined the lab of Amos Winter, an assistant professor of mechanical engineering, in 2012. The lab was just getting established, and the aim of Wright’s project was vague at first: Work on water treatment in India, with a possible focus on filtering biological contaminants from groundwater to make it safe to drink. There are already a number of filters on the market that can do this, and during her second trip to India, Wright interviewed a number of villagers, finding that many of them weren’t using these filters. She became skeptical of how useful it would be to develop yet another device like this. Although the available filters made water safe to drink, they did nothing to mitigate its saltiness — so the villagers’ drinking water tasted bad and eroded pots and pans, providing little motivation to use these filters. In reviewing the list of questions she had prepared for her interviews with locals, Wright noticed that there were no questions about the water’s salty taste. “The biggest surprise of the project so far has been this salt issue, which was the thing that changed the entire purpose of the research,” she adds. Almost 60 percent of India has groundwater that’s noticeably salty, so later, after returning to MIT, Wright began designing an electrodialysis desalination system, which uses a difference in electric potential to pull salt out of water. This type of desalination system has been around since the 1950s, but is typically only used municipally, to justify its costs. Wright’s project aims to build a system that’s scaled for a village of 5,000 people and still cost-effective. While other companies are already installing desalination systems across India, their designs are intended to be grid-powered. When operating off the grid, these systems are not cost-effective, essentially blocking disconnected, rural villages from using them. Wright’s solution offers an alternative to grid power: She’s designed a village-scale desalination system that runs on solar power. Since her system is powered by the sun, operational and maintenance costs are fairly minimal: The system requires an occasional cartridge filter change, and that’s it. The system is also equipped to treat the biological contaminants that Wright initially thought she’d be treating, using ultraviolet light. The end result is safe drinking water that also tastes good. Earlier this year, Wright’s team won a grant from the United States Agency for International Development (USAID), enabling the researchers to test this system at full scale for the first time in New Mexico two months ago. A second stage of the grant will help bring a pilot to India this summer. Local farmers will use the system and provide feedback at a conference organized by Jain Irrigation, Inc., a company based in Jalgaon, India. Wright’s team is now looking to find out how easy it is for users. The USAID competition was actually intended for systems built for individual farms, but Wright calculated that the amount of water used by a single farm is similar to the amount of water that a small village needs for its daily drinking water — 6 to 12 cubic meters. Although Wright’s work is currently focused on rural villages in India, she sees many uses for the technology in the United States as well. In isolated areas, such as the ranches in New Mexico where she tested her system at full scale, poor access to water pipelines often leads to a heavy reliance on well water. But some ranchers find that even their livestock won’t tolerate the saltiness of this water. Be the first to comment on "Safe Drinking Water Via Solar Power Desalination"